Leaves are falling all around and a weekend of classics gets under way with Il Lombardia this Saturday and Paris-Tours on Sunday, a final hurrah for the 2017 season. This year’s route reverts to a recent formula with steep climbs to tilt the race to the climbers. The Course: 247km and 4,000m of vertical gain backloaded into the final two hours. Unlike the other monuments, Il Lombardia changes its route regularly and 2017 is a lot like 2015 when Vincenzo Nibali soloed away from Thibaut Pinot et al. 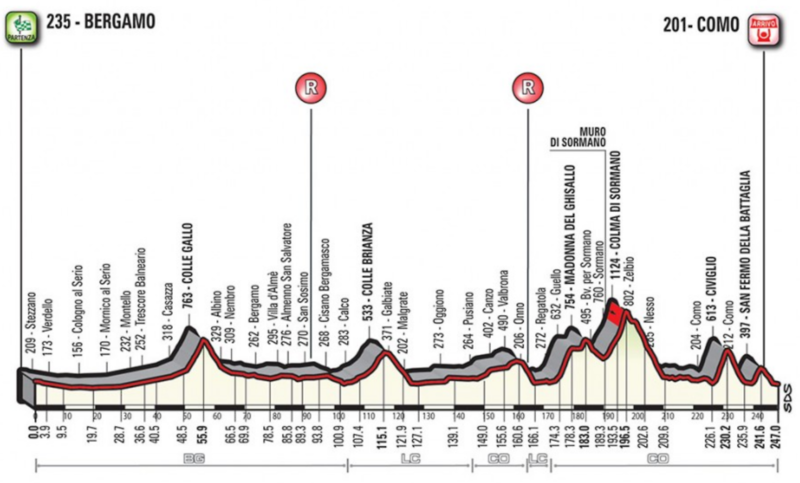 A start in Bergamo – last year’s finish – sees the race head to the Colle Gallo, a good steady climb of 6km at 6.9%, maxxing at 10% and followed by a wide descent with some tight bends yet few surprises before the race takes the Serio valley back to Bergamo and the feedzone. The climb to Colle Brianza is 4km at 7% which sounds fine only near the top it’s 20%. A descent and then the scenic loop alongside the shores of Lake Como to Bellagio and the start of the Madonna del Ghisallo climb. The climb, thanks to this race and the sanctuary at the top, is among the most well-known roads in the sport, a marriage of sport and religion. It starts hard with 10% gradients and tight hairpin bends. The first four kilometres continue at 9% with some steeper ramps before the road levels out from Palaino to Civenna before the final ramps to the Ghisallo chapel. It is really two climbs, a steep early section followed by flat and even downhill sections as the route goes through the village of Guello before the final kick via snaking hairpin bends to the chapel… and then there’s a pesky false flat that drags on and then a high speed descent with blind bends and some off camber corners. Next comes the Muro di Sormano, a climb so steep that it’s hard to attack with 2km at 15% and 25% for a while. It’s an infamous climb, described by 1958 Giro winner Ercole Baldini as unnecessary and “beastly, impossible to ride” but today’s gearing makes it more accessible. If anything the climb is the manageable part as you’ve either got what it takes or not and the descent is harder because it’s wild in places. Next is the climb to Civiglio, a regular 10% ramp all the way up for 4km making it very difficult after 220km. The Finish: the race dips into Como but heads out for the decisive final climb of San Fermo della Battaglia, a series of 7% ramps winding up to the 5km to go point and then followed by a regular descent with tight bends which flattens out with just over 1km to go. 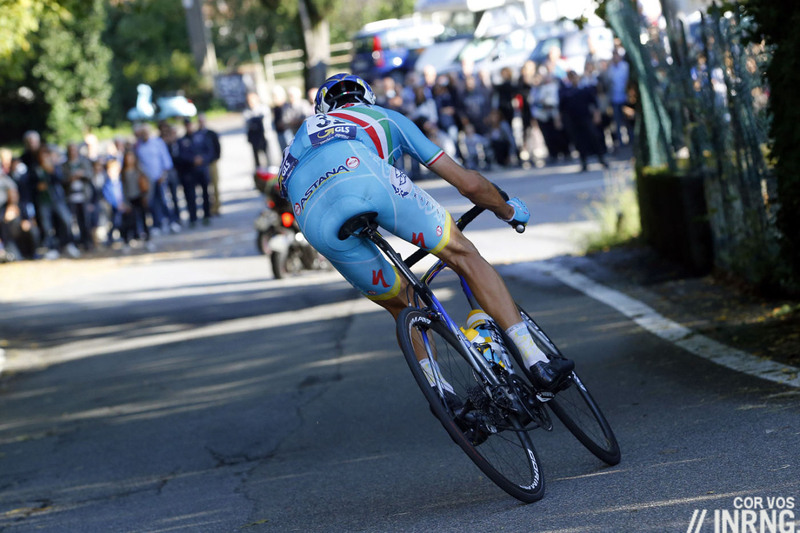 The Contenders: Vincenzo Nibali is the prime pick. He’s in form as recent results show and if a win hasn’t arrived it’s either because of his team mate triumphing in the Giro dell’Emilia or the course not being selective enough in the Tre Valle Varesine. He’s won this race before, in fact he won on this very course and used the final descent to slip the others (pictured) and could pull the same move again because it’s one thing to know he’s going to attack here, quite another to follow him. Bahrain-Merida have been strong in recent days too with fellow Sicilian Giovanni Visconti a useful foil in case everyone watches Nibali too much. 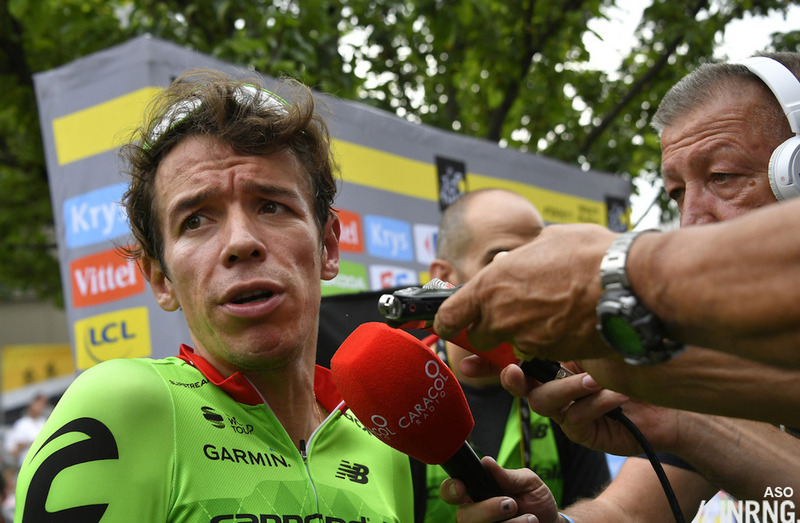 Rigoberto Urán was third in Milano-Torino last year before finishing third in Lombardia. Now he’s won Milano-Torino this week so will he win? He has to be a strong pick as he’s in form and a wily racer too who can pick his moments and normally sprints well from a small group. Cannondale-Drapac team mate Davide Villella is a long shot too. 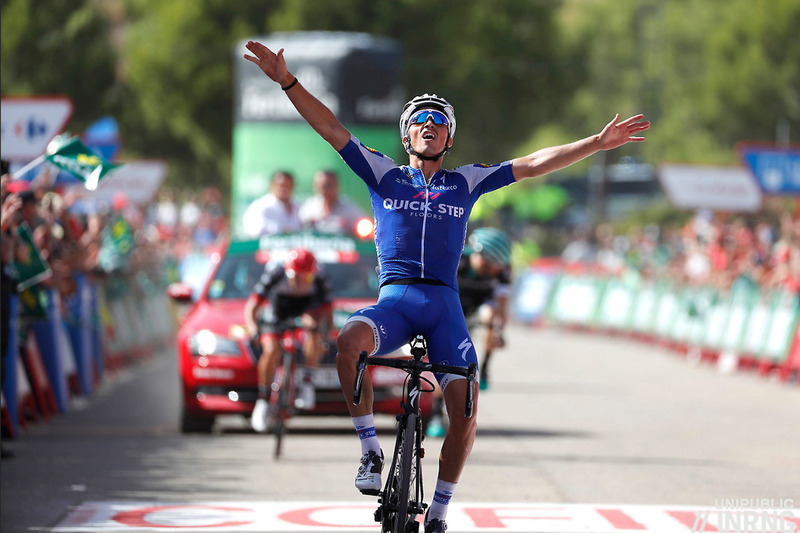 Julian Alaphilippe has several cards to play but his problem is he shows his hand often and early. This is great entertainment and he’s formidably talented but the clinical finishing skills are still a work-in-progress. He’s both explosive on the climbs, lively on the descents and sprints well as we saw in the Vuelta. Quick Step come with a top heavy team with previous Lombardia winners Dan Martin and Philippe Gilbert. Martin is great for these climbs while Gilbert is less explosive these days but can still contend. 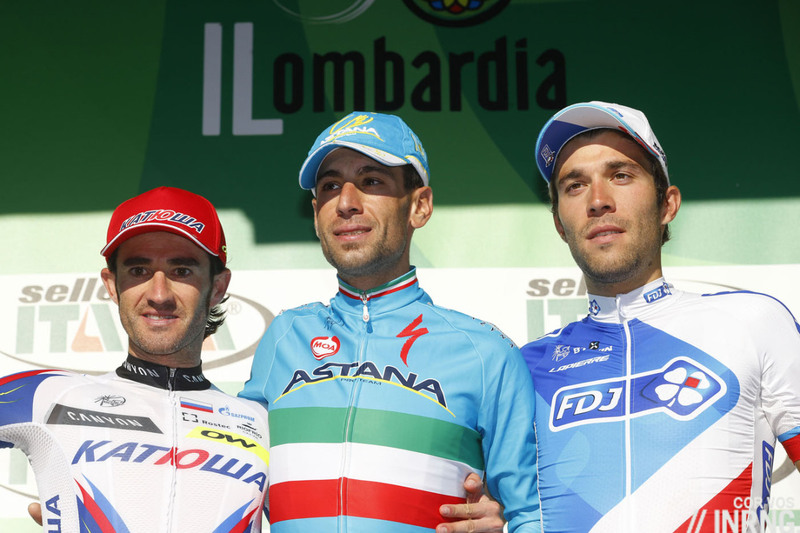 Thibaut Pinot loves racing in Italy and it shows. He’s been second third here before. But how to win? His best card is climbing but the finale has short, sharp climbs which aren’t his preferred choice. His podium in 2015 dispelled the talk he’s a bad descender but it’s hard to see him solo away even if he’s tough to bring back should he get a gap and his sprint isn’t famous. David Gaudu impressed in Turin too but 247km is a big ask, he’ll be learning and banking the kilometres. Adam Yates was second on the Superga on Thursday after a crash hampered him on the way to the final climb and he can sprint well. He is the sole leader for Orica-Scott with Jack Haig as an option and Robert Power one to watch too. 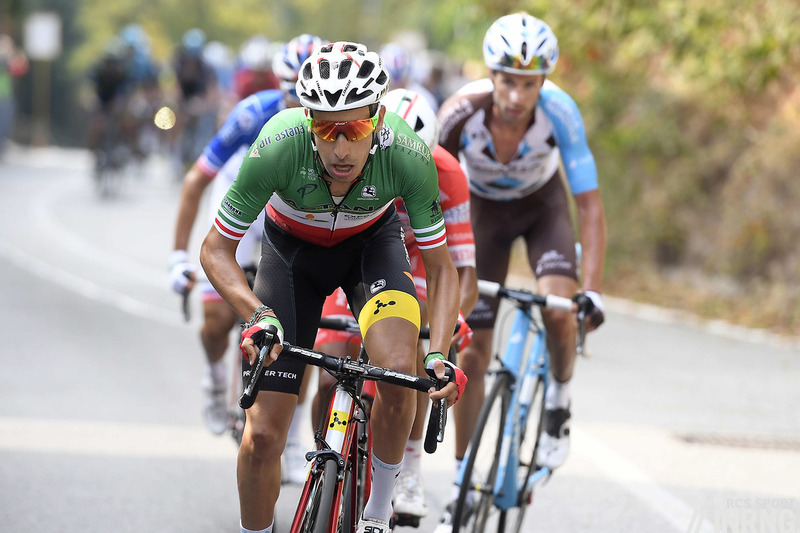 Fabio Aru has been close in recent races but how does he win? It’s hard to see, he can attack but hasn’t been decisive on the climbs of late and he’s not got a big gallop in those foal-like legs for a sprint out of a small group, he’s never won a sprint in his pro career, even out of a small group. Astana have Luis-Leon Sanchez and Jacob Fuglsang, both winners in races last weekend. Who is fetching the bottles at Team Sky? On paper Michał Kwiatkowski is made for a course like this but his flower power seems to be wilting right now. Wout Poels and Gianni Moscon seem to be their best picks and will want to salvage something for differing reasons while Sergio Henao and Diego Rosa could be in the mix too. A similar question chez Ag2r La Mondiale: a strong team but who is their best rider? Alexandre Geniez is back in form but Jan Bakelants, Domenico Pozzovivo and Pierre Latour are all outsiders, especially Latour who could try a long range move. Diego Ulissi is still a prototype rider for this kind of race and his UAE-Emirates team, despite the labels, hails from this region and Valerio Conti as a long shot. Sunweb’s best chance might be Sam Oomen but Tom Dumoulinwill be interesting to watch is said to be ill. Stephen Cummings can do his surprise attack but the steep, twisting roads don’t suit him as well as a mid-mountain stage. We’ll see Egan Bernal for the last time in the Androni jersey, still just 20 but an outsider. Tim Wellens has been training hard for this and comes with Lotto-Soudal team mates like Tiesj Benoot and Tony Gallopin with whom he often riffs off. BMC’s Ben Hermans is strong but an infrequent winner, like his team mate Nicolas Roche. Nairo Quintana rides but a win seems a big ask. Finally Damiano Cunego rides, he won in 2004, 2007 and 2008 and won’t win but is still “only” 36. Weather: a fine autumnal day, a top temperature of 20°C and some sunshine. I thought Pinot came third not second in 2015 ? Also, I think he has a half decent sprint (see his win in the Giro and tour of the Alpes). Thanks for a great write-up ! What about Lands, I thought he was down to start. Is that a led zep reference I see? Thanks for a great preview as always, I’ll stop rambling on now…. Landa’s got a chance but hard to pick among the Sky riders and since he’s leaving the team maybe there’s a communication breakdown and they won’t be so keen to ride for him. I doubt there’s a whole lotta love there. He could be a heartbreaker or a fool in the rain. Dave, Dave, Dave I’m gonna leave you! He seems more interested in talking with his mouth than talking with his legs right now. and what about Quintana too. The distance will intimidate him less than many and his recent progress seems right. He even looked more comfortable than many yesterday. Three chain rings I think. Can’t agree with the top billing for Alaphilippe who only looked good at a time when the serious opposition was holding back. Two rings. It’s nearly over. How will be pass the dark days of winter? He’s not a prolific winner, especially in one day races and he needs an explosive jump to win a race like this and surely he has to be as stale as a packet of breakfast biscotti by now after his long season? I’m surprised he’s riding really, had thought he’d be relaxing and awaiting the Giro and Tour routes before making plans for next year. Maybe a contractual tie with RCS, post Giro and all that? Ben, I’d seriously counsel that you record it and watch it all. There is a gradual whittling down process and if you just watch highlights then you’ll be asking yourself ‘where did XXXX go?’ as the highlights chop from one part of the race to another. That’s kind of different to ‘all action’ from start to finish but it is such a beautiful race scenery-wise that it’ll get you through the slower burning parts. …and besides the scenery is great and if you don’t want to watch remember this is about it until the last weekend in February to watch a legendary race with star names launching long range moves. Agreed. Which is why it is so frustrating that Eurosport Australia seem to only start coverage very late on in the piece (often catching only the last 20kms or so). Unfortunately , this race can be dogged by poor TV coverage due to the weather quite often but there’s not much organisers can do about that. One thing they can do is get the motorbikes out of the way. Their interference has become a complete joke these days. ‘The Home of Cycling’® British Eurosport decided it was more important to bring us under 17s football than the first half hour of coverage. You can really tell the season is ending. Only 18 comments on the eve of one of the three most interesting one day races on the calendar and surely the most beautiful one. I suppose the final will be a real thriller with no hands-down favorite and some guys showing some really impressive late season shape. But you’re right, INRNG it’s probably Nibali’s race to lose. He’s still due a big win in his new colours, right? In 2015 Rosa saved the race for him, last year it was Rosa’s turn to win but he messed up his sprint. Nibali, Rosa and Uran will probably be the ones who want this win the most. But Rosa was not looking that good on the San Luca Climb last Sunday I’m afraid. Is there any video coverage available anywhere?? Mr. Inrng, you called it again. Amazing! I agree, same part of the course, amazing! It’s one thing to know what to do when and where but to actually be able to do it… Nibali gets plenty of criticism about his GT wins/abilities but to me this shows he’s still one of the best riders around. Nibali yay, so pleased. Better a single day racer than churning out the long haul stagers. Great stuff.